the full transfer rate of thunderbolt USB-C 40 Gigabits per second. Now found on the iMac and the MacBook Pro. With the newest models of MacBooks, Apple continues to tighten its grip on its users by doing away with the old ports that are needed for older accessories. To further frustrate people who are replacing their older model Mac with a MacBook, their old accessories now need adapters to plug into the USB-C port that has now replaced all the older ports found on the earlier models. To further add insult to injury unless you purchased a MacBook Pro, you might find that all your accessories have to share the same USB-C port one at a time. USB-C is a new standard that has a plug that can be plugged in with either side facing up. That is the least significant feature of the new USB-C standard. A USB-C port could have a data transfer rate that is eight times faster than an older USB port and how fast it is depends on the specs of the computer. That said it is just as likely that the new USB-C port on your MacBook, that Apple is glorifying, only has the much slower USB 3 transfer rate. The technical specs of your MacBook will tell you the transfer rate of its USB-C port and it could be just 5 Gigabits per second. If you just purchased a new MacBook Pro, you have USB-C thunderbolt ports with the 40 Gigabits per second (Gbps) transfer rate. Models at Apple appear quickly, so you will need to check the specs on your MacBook, but to my knowledge thunderbolt 40 Gigabits per second is only, at this time, found on the new iMac and the MacBook Pro. Apple indicates that the USB-C thunderbolt ports on the iMac and the MacBook Pro can, in less than one minute, copy 14hours of HD video, 25,000 photos, or 10,000 songs (https://www.apple.com/thunderbolt/). OWC’s Thunderbolt 3 has two USB ports that are capable of this transfer rate. At this time the OWC Thunderbolt 3 is only available for Mac computers. OWC will soon release a new model that will work with Windows. Let’s take a look at the OWC Thunderbolt 3 ports. You have two thunderbolt 3 (40 Gbps) ports, Four USB 3.1 ports, one S/PDIF Digital Audio Port, one Fire Wire 800 port, one Ethernet port, one Mini Display port, one SD slot (Micro SD cards usually come with an SD adapter which you will need to use for Micro SD cards), one Combo Audio port, and one high power USB3.1 port. See photos 2 & 3..
1. Data LED (green) - This LED will glow green when the dock has an active data connection to a computer via the Thunderbolt cable. If the computer is powered off or in sleep mode, this LED will power off. 2. Power LED (blue) - This LED glows blue when the dock receives power. 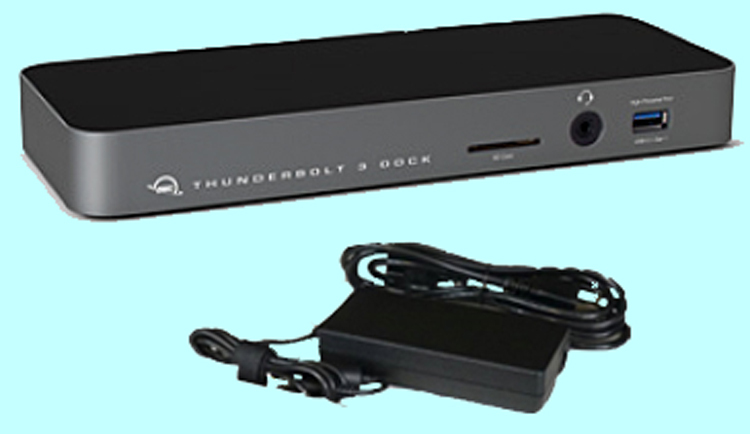 Unlike some Thunderbolt devices, the Thunderbolt 3 Dock does not power off when disconnected from the computer or when the computer sleeps. As long as the dock receives power, the blue power LED will remain on. 3. SD Card Slot - accepts SD type media cards commonly used in digital cameras. 4. Combo Audio Port - accepts 3.5 mm microphones and headphones. 5. High-power USB 3.1 Gen 1 port - Connect USB 3.1 Gen 1 devices here. This port is capable of providing up to 1.5A of power for charging devices such as the Apple iPad. Its functionality and performance is otherwise the same as a standard USB 3.1 Gen 1 port. 1. (4) USB 3.1 Gen 1 ports - Connect additional USB 3.1 Gen 1 devices here. Left-most port is a high-power port. This port is capable of providing up to 1.5A of power for charging devices such as the Apple iPad. Its functionality and performance is otherwise the same as a standard USB 3.1 Gen 1 port. 2.S/PDIF Digital Audio port (output only) - Connect a S/PDIF output device here. 3.FireWire 800 (1394b) port - Connect a FireWire device here. You can daisy-chain additional FireWire devices off of the first FireWire device. 4.Gigabit Ethernet port - Connect an Ethernet cable here to access a wired network. 5.Thunderbolt 3 ports - Connect one port to the Thunderbolt port on your computer. Use the other port to connect up to five additional Thunderbolt devices, plus a display. Thunderbolt 3 supports DisplayPort™ 1.2 over USB-C™ . See Section 2.2 for more details. 6.Mini DisplayPort - Connect your display here. This connection supports DisplayPort 1.2. See Section 2.2 for more details. 7.DC power input - Connect the included power supply here.